There's no shortage of bluetooth speakers on the market. And the vast majority are decidedly unmemorable. However, the Philips Shoqbox Mini BT2200 brings enough features together to make it worth a second look, especially for a home office or for music in the shower (if that's on your list). While there's no one feature that really stands out, the Shoqbox Mini offers decent sound, an excellent speakerphone and IPX6 water resistance (no problem getting this baby soaking wet), in a compact package and at a compact price of around $59. The Shoqbox Mini is a tiny device about the size of a hand grenade (not to be confused with the Philips SoundShooter which actually LOOKS like a hand grenade, too). It has an attractive, if not exactly exciting, design that makes the speaker sit rather unobtrusively on a desk. You can get it in any color you want, as long as that color is black. The Shoqbox Mini has a single 1.6-inch speaker driven by 2.8 Watts of power, so I didn't expect miracles in terms of sound quality (If ultimate sound is your goal, I suggest our top pick for the Best Portable Bluetooth Speaker, the Logitech UE Boom at $199). That said, the quality of the music you get out of the Shoqbox Mini is pretty good for its size. Bass is lacking, but there's more than many other mini speakers I've listened to, and the midtones and vocals are clear and distinct. This isn't a speaker you're going to use for filling a room with music, but it's well-suited to a home office or a smaller kid's room, where you want to keep volume down, anyway. When paired with your cellphone via Bluetooth, the Mini can operate as a speakerphone via its built-in mic. Here, its lack of bass is less relevant. Voices from the other side come across very naturally, far better than the speakerphone on either my cellphone or my landline. 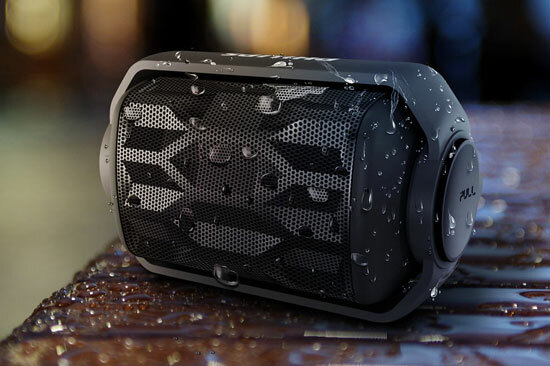 While many Bluetooth speakers offer IPX4 water resistance (equivalent to a playful splash), the Shoqbox Mini is rated at IPX6, enabling it to take heavy splashing and even mild submersion (it floats, too). So if you're looking for a little music in the shower or bath, the Mini will work well. Heck, you could even take a conference call in there if you're so inclined. The Shoqbox Mini does not have an impact resistance rating. However, it seems to be a solid unit that will hold up well under normal use outdoors or in a kid's room. In addition to the features already discussed, the Mini has an audio input jack, on-board volume controls and a rechargeable Lithium battery, good for about five hours of operating time. I wish the battery life were a little longer. At right around $58 on Amazon, the Shoqbox Mini BT2200 offers a pretty good deal for the money. There certainly are better Bluetooth speakers out there. And there certainly are cheaper. But if you want an ultra-compact model that delivers on sound, while offering an excellent speakerphone and/or a high level of water resistance, I think you'll be pleased with the Philips Shoqbox Mini.